:In our culture of busy there is enough to keep up to without having difficulty with following your yoga class. In our yoga class we will question the need to live this way on and off our yoga mats. 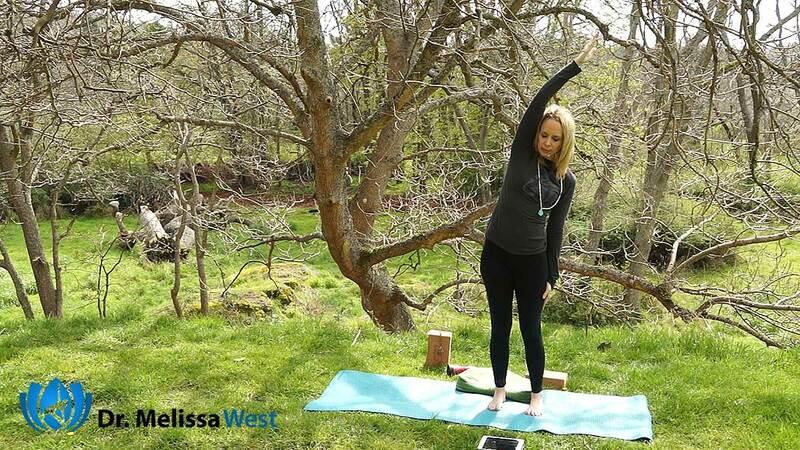 We will question our assumptions about stress, struggle and effort whether it be on our yoga mat or in our lives and set an intention to find ease and effortlessness. 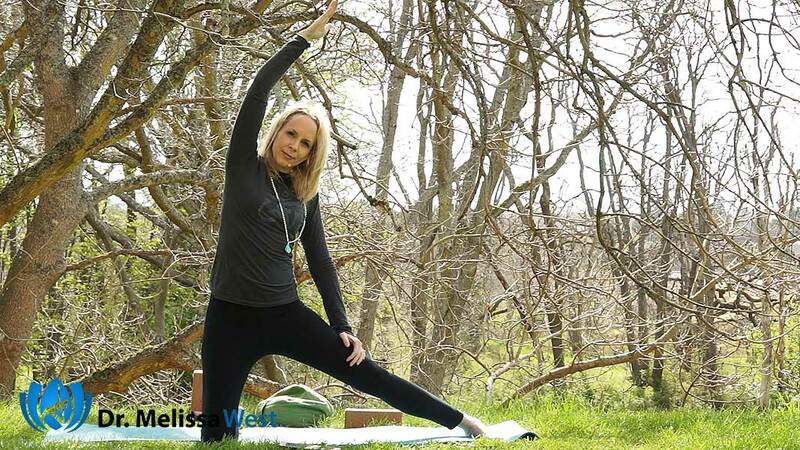 When we become conscious that our life, let alone our yoga is filled with strain, we open up the possibility for awareness and a different choice. Quite often we are not aware of chronic tension and stress because it is culturally normal, accepted, unquestioned, taken as necessary and even a positive attribute. Ingrid Bacci facetiously says, “everywhere I turn people hold onto stress like children clutching their precious lollipops.” Indeed, our culture actually rewards stress. The more competitive you are, the more you are rewarded. The more you accumulate, the more recognition you receive. Today, in our easy to follow yoga class, we are going to cultivate the opposite. We are going to become conscious of our felt sensations in our body. We are going to focus on how to feel ease in our bodies. We are going to set the intention to move with less tension. This might be a major change in the way you experience your body. When we put too much focus on effort and doing four things happen. Number one, we get over focused on the results and forget how we are feeling inside. Number two, we tend to act from a place of anxiety and tension. Number three, we project our tension outwards thinking it is the project, person or situation that is making us tense. Number four, we assume that getting the job done is linked with the tension and so we accept the tension as normal. Alternatively when we come from a place of effortless ease four rather positive things happen. Number one, we focus more on how we feel inside rather than the results we want to achieve. Number two, our attention stays on the inner calm rather than anxiety. Number three, external pressures become a way to steady our internal balance and composure. Number four, we keep our attention on finding ease, creativity and enjoyment in our activities. 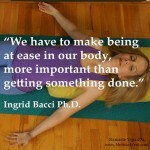 Today we will set the intention to have being at ease in our bodies be more important than getting something done. We will allow ourselves to be deeply and totally absorbed in the sensation of what is happening in our bodies. We will let go of comparison and thinking about how other people see us. There is no rush here or struggle to achieve anything. If you are feeling it, you are doing it. 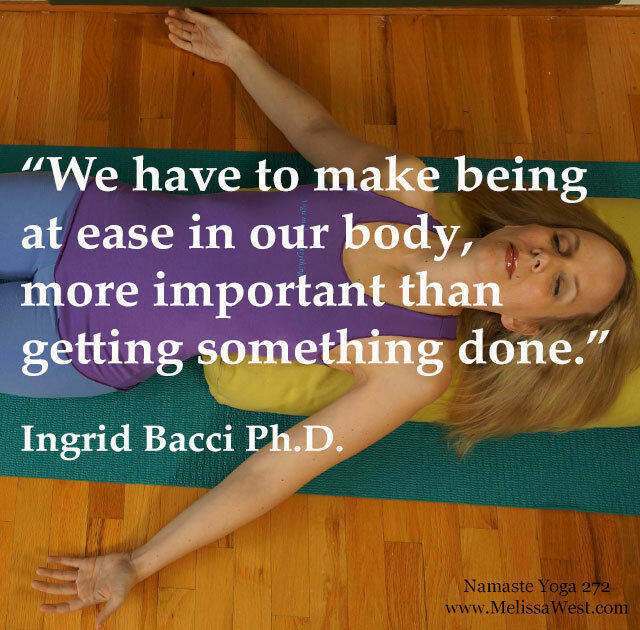 Resource: Effortless Living by Ingrid Bacci Ph.D.
Today’s question to answer in the comments is: What is one small thing you are going to do to bring more ease to your life.